Blue is a quarter pony, aptly named for having one blue eye and one brown eye. 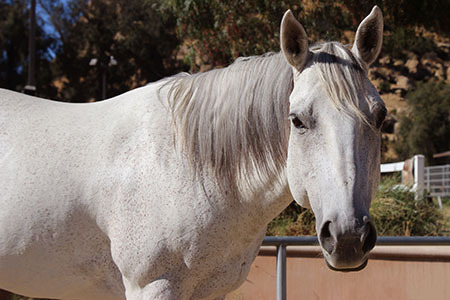 She is one of our most reliable school ponies, and is used for Adaptive Riding lessons as well as Hippotherapy. 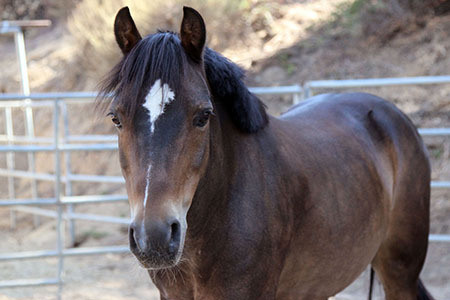 Courtney is a Morgan mare who competed in Dressage before coming to Ride On. With her great training and sweet personality, she's been a star in both Hippotherapy sessions and Adaptive Riding lessons! 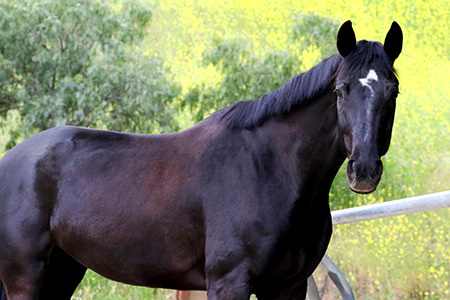 Don Giovanni is a stunning Hanoverian gelding with a very sweet personality! With his background in Dressage, he has been a great addition to our program for our independent riders learning to ride up the levels in this sport. 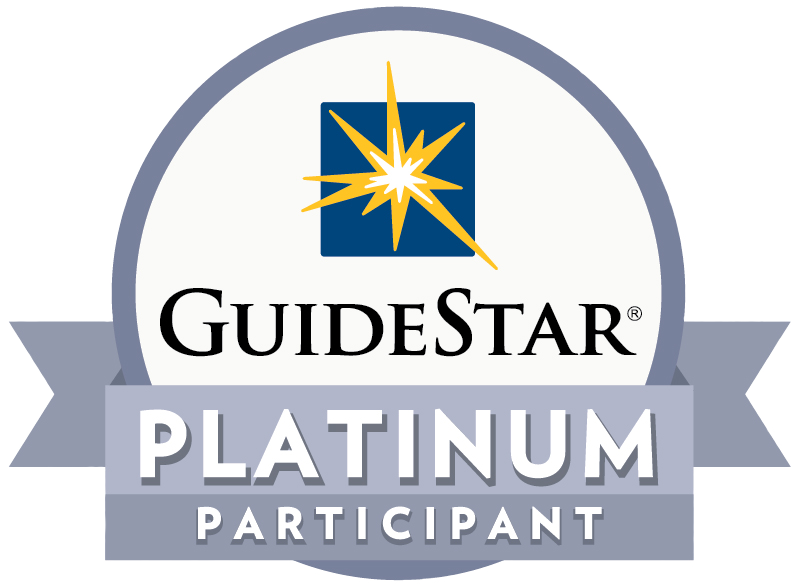 He is an active star in the Para-Dressage aspect of our program. He has also already come home with several blue ribbons from shows with our riders! 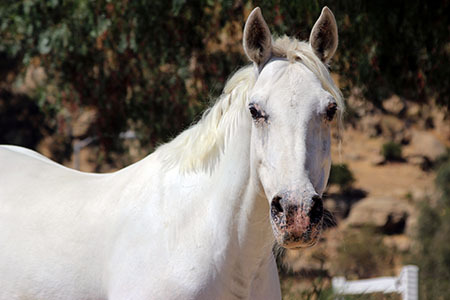 Frosty is a beautiful quarter horse gelding who is loved by many! We sometimes say he thinks he's a dog--he loves people more than anything and if he could he'd probably sit in your lap! 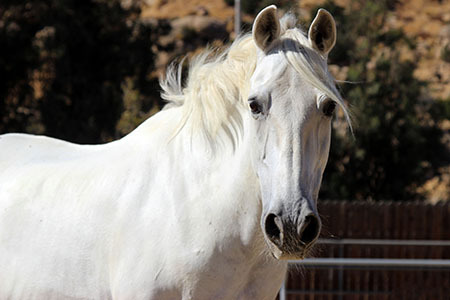 Frosty has taught many riders how to trot with his smooth and steady trot rhythm. He also goes to Trailfest every year and is a superstar! Holly is a Fell Pony who has been learning long lining for our Hippotherapy program. She is great in our Adaptive Riding lessons and Hippotherapy program! 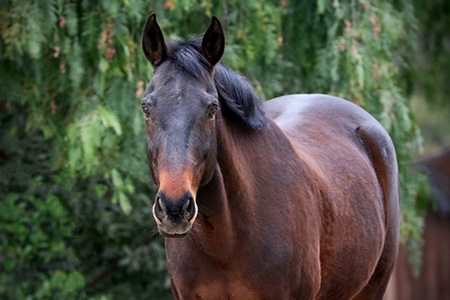 Jazz is an off-the-track Thoroughbred, meaning he used to be a racehorse! He has both a dressage and jumping background, and is a lot of fun for our riders. Leon is a Holsteiner gelding who used to be a jumper before coming to Ride On. 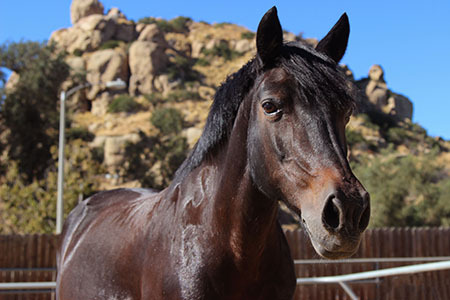 Although he's our largest horse at our Chatsworth Ranch, he really is a gentle giant! While he's great in independent lessons at the walk, trot, and canter, he also has a wonderful temperament for our led lessons. We love his mellow demeanor and are very grateful he's a part of our program! 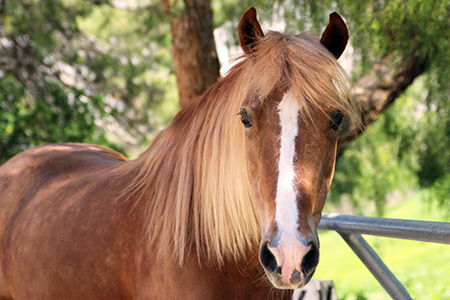 Linus is a Haflinger cross who has been at Ride On for quite a long time! 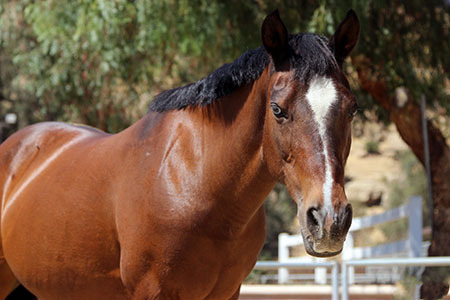 He is a favorite in Hippotherapy, but is frequently used in Adaptive Riding lessons as well. Lusco is an all star! 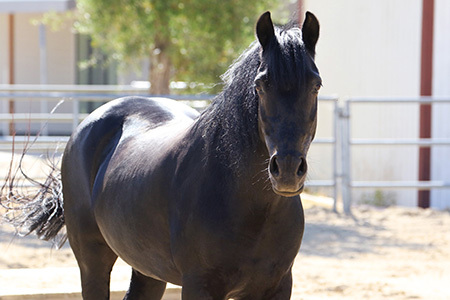 He's an Andalusian gelding who did just about everything- hippotherapy, TR lessons, events, horse shows...he was even AHA (American Hippotherapy Association) Horse of the Year in 2013! Though he is in retirement, he still teaches riders and volunteers how to groom and tack a horse. He is always trustworthy and a true favorite at Ride On. 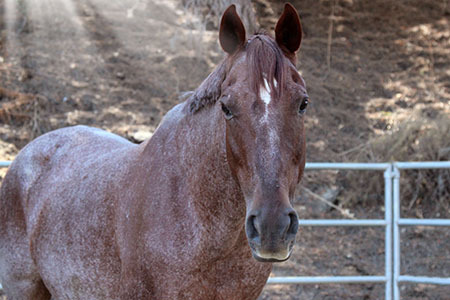 Montana is a PMU rescue, draft cross mare. She has been with Ride On since she was very young, and has done jumping, dressage and Ride On events! 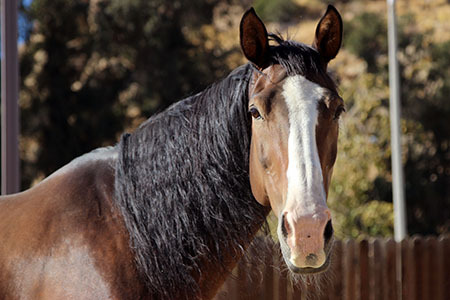 Mr. Pibb is a beautiful bay Quarter Horse. 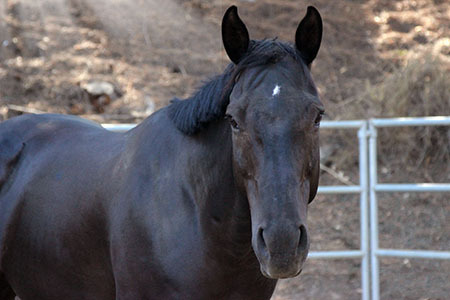 He is great in walk and trot lessons, and loves trail rides such as our annual Trailfest. We love Mr. Pibb for his reliability and charming nature! Pebbles is a Welsh Pony cross who used to pull wagons and carts. Now she is used in walk lessons and a star in hippotherapy! She has the most gentle and sweet personality. We love Pebbles! 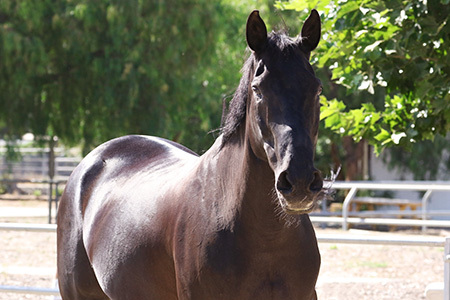 Windtanz is an ex-eventer from Calabasas, CA. He is sure to win you over with his calm, sweet personality. He is lots of fun and a great therapeutic riding center horse! 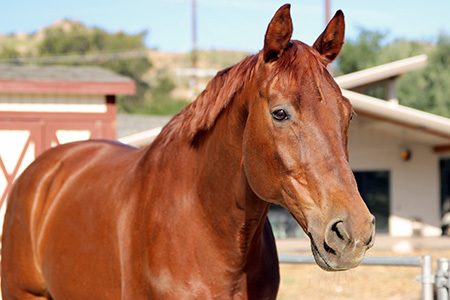 Bailey is a chestnut warmblood, who used to be a jumper. She is an all around great lesson horse- her bouncy trot has given many riders a strong posting seat! 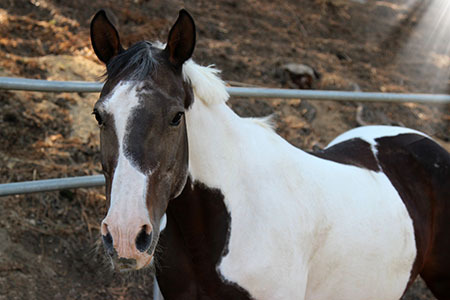 Betty is a paint pony with one of the cutest faces ever! She's great in walk, trot, and canter lessons and has been to many Ride On events and horse shows as well. 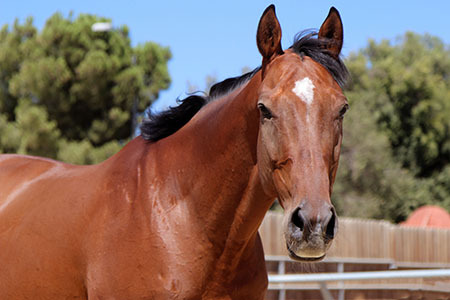 Bjorn is one of the original Ride On Newbury Park horses, and a favorite by many! He is a Norwegian Fjord- known for his good looks. You can find Bjorn every year at our annual Trailfest- he loves taking riders out on the trails! 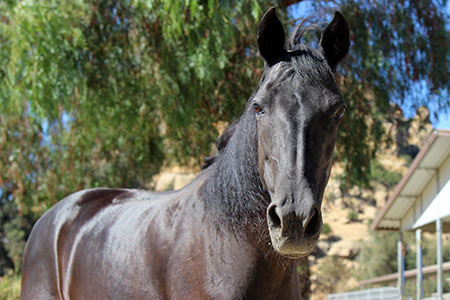 Dakota is a beautiful black quarter horse who has been at Ride On for quite awhile now! He has helped many riders build confidence and learn new things! Dakota is part of Ride On's dressage show team as well. 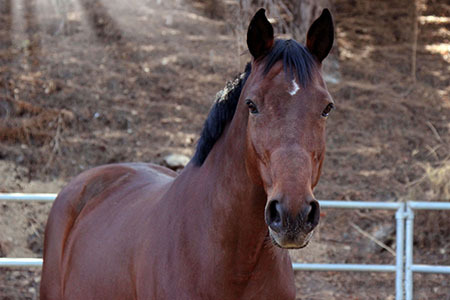 Dante is a Warmblood gelding with a beatiful bay coat! Not only does he have stunning looks, but he's a beautiful mover as well! 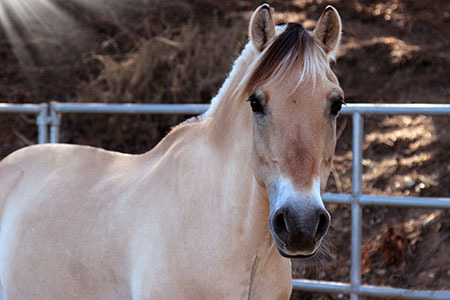 Faye is a gorgeous buckskin quarter pony who is a favorite by many, especially in Hippotherapy! She does great in long lines, Adaptive Riding lessons and even lunge lessons! 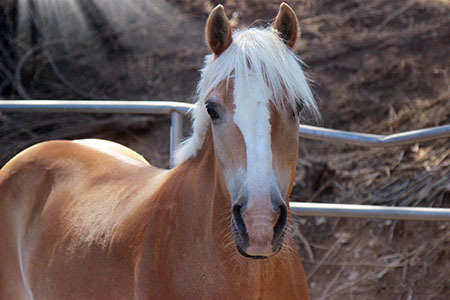 Fizz is a Haflinger mare that has been at Ride On for quite some time now! She is a superstar in Hippotherapy, but you'll also see her in led lessons, walk/trot or walk/trot/canter lessons. Fizz is a go getter with a lot of personality! 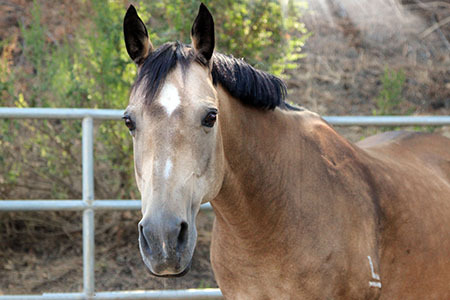 Kara is a Morgan mare with fantastic training and a go-getter personality! Her smooth gaits and forward demeanor makes her a very fun horse for our riders at the walk, trot and canter. She is also an active member of our Para-Dressage team and a wonderful horse for riders of all abilities to learn on! Mambo is a Dutch Warmblood gelding who used to be a hunter jumper...he definitely has a personality! He also competed and won awards at rated dressage shows at 1st and 2nd Level! He continues to teach riders and volunteers how to groom and tack a horse. Rye is a Warmblood/Quarter Horse cross, with a unique red roan coat. He is used in all types of Adaptive Riding lessons and you can see him every year at Trailfest! Silhouette is the smallest member of the Ride On family...a Miniature Horse! While she may not carry riders on her back, she has many other talents including pulling a cart, teaching our little ones how to groom, helping riders and volunteers practice leading, and being a great "starter horse" for those who may be a little intimidated by our larger equines! 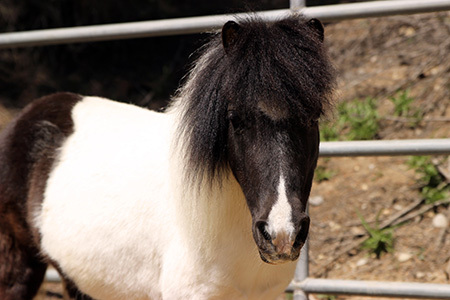 Tigerlily is our smallest pony at our Newbury Park ranch, and had a history in jumping before coming to Ride On. With her calm and gentle demeanor, she's a great pony for our littlest riders to learn to groom, tack up and ride on! 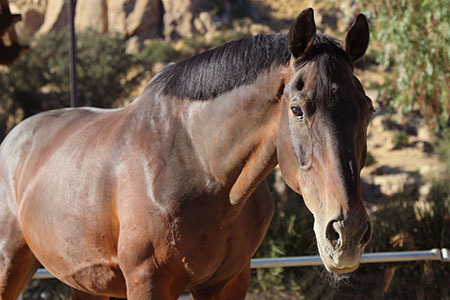 Rio is a Quarter Horse gelding born in 2002, who arrived at Ride On in 2013. 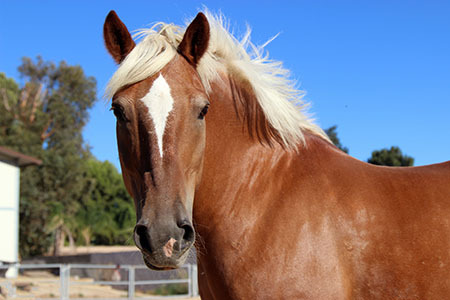 Previously, he had been a therapeutic riding horse in many different places for most of his life. He's lived in Georgia, Colorado, New York, and now Southern California. Quite the traveler! 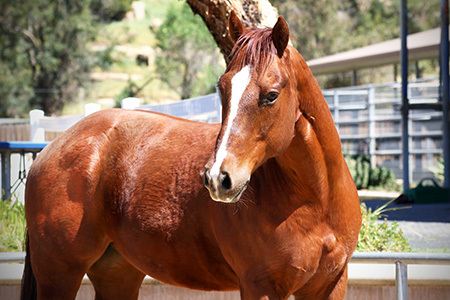 Chili is an 8 year old Quarter Horse gelding and the newest addition to our Chatsworth ranch. With a previous background in western training, he's got a great "whoa" and is very responsive to the reins! He's a fantastic lesson horse with a kind and gentle spirit that's boosted a lot of our riders' confidence. 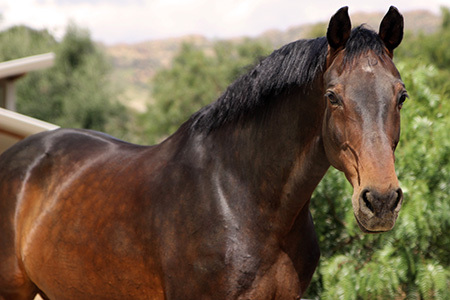 "Beauty" is a 7 year old Hanoverian mare whose sire is Sir Wanabi. She has training in the discipline of Dressage and has already been successful in the show ring. She dreams, however, of becoming a top level Para-Dressage horse! 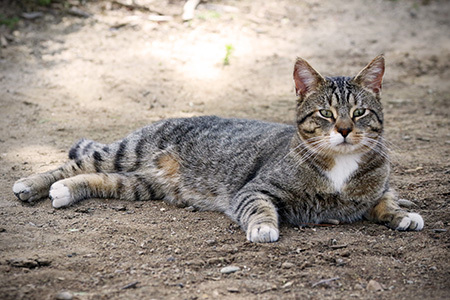 Winston is a Barn Cat in Chatsworth! He loves to visit the horses! 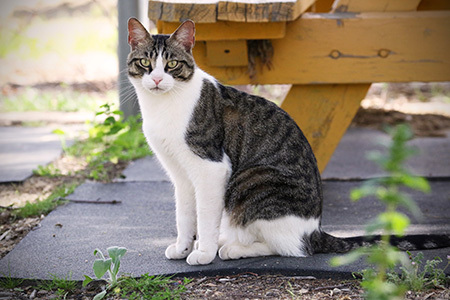 Batman is a Barn Cat in Chatsworth! He loves to hide...and seek! 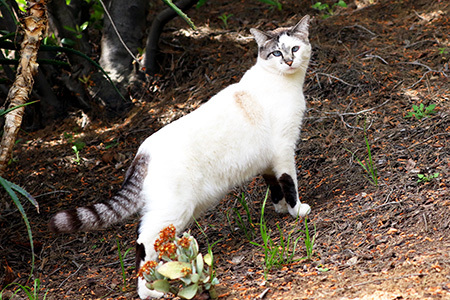 Spider Cat is a Barn Cat in Newbury Park! He loves to explore! 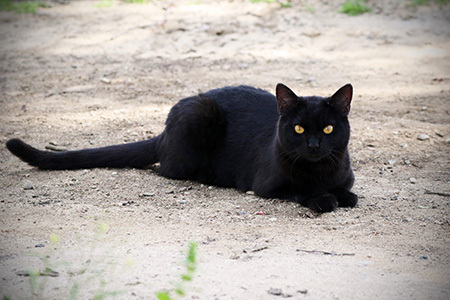 Binx is a Barn Cat in Chatsworth! He loves to hang out with his "brother", Batman!